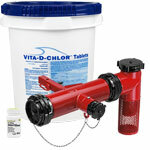 Get started right and SAVE money by packaging up Vita-D-Chlor with a diffuser by purchasing a KIT!! That's right, our KIT's give you what you need for less. They come with the diffuser of your choice as well as a large pail of Vita-D-Chlor. Ideal for those that are new to dechlorination or looking to add/replace a diffuser to their hydrant flushing program or other water utility maintenance. Contact us to find out how much you can save vs. buying the two items separately. 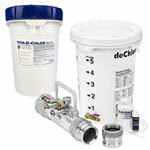 The Zde-chlorinator saves time and time is money. Light compact and easy to use with our convenient tablets. 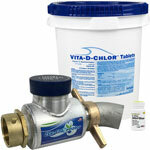 The de-Chlorinator saves money through accurate dosing that is not achievable with tablet devices, and the Vita-D-Chlor Granular saves you money over the same material in tablet sized form. 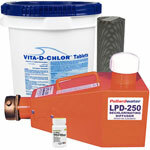 The LPD-250 is a workhorse dechlorination device. It saves time and time is money. Easy to use with our convenient tablets. The Hydro-Hitch is the "big gun" of dechlorination diffusers. 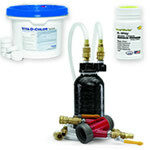 It will work with your steamer or pumper ports for max flow results. The Dechlor Demon is a favorite for fire flow testing.